So many things distinguish the winter person from the weaker members of the community. IQ. Dashing good looks. The ability to use "base-layer" in a sentence. 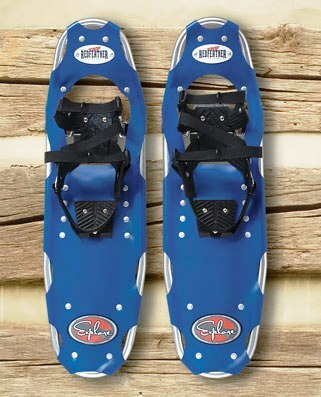 Of course, non-winter people don't even own snowshoes, much less ones of this caliber. These folks are missing the game. Shoot, they don't even know there''s a game going on. Say something about this pair of shoe's impressive flotation in the deepest snow and you might as well be talking in code. Which you kind of are. CRAMPONS: Lynx&trade, stainless-steel crampon system with aggressive rear crampons for stability when descending a hill. Powder-coated to shed snow and ice. BINDINGS: CONTROL: A rugged, secure binding which features a solid polymer heel plate, semi-rigid injection-molded polyurethane toe and heel frames for superior lateral support, quick-adjust nylon webbing to secure foot in frames, and a flexible urethane heel strap which stretches to hold heel of boot securely. HINGE: Pivot Rod Hinge does not lift heel of shoe on each step, allowing tail to drag in snow for added flotation - and keeps tips up for use in deeper snow. model 25 | weight: 3.8 lbs. user weight: up to 175 lbs. model 30 | weight: 4.2 lbs. user weight: up to 220 lbs. model 36 | weight: 5.1 lbs. user weight: over 220 lbs.